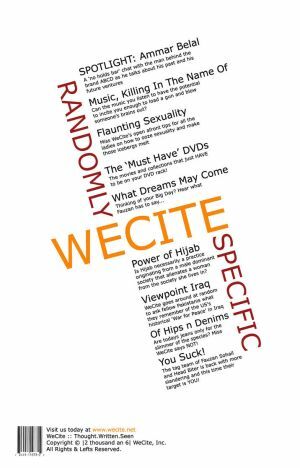 Islamabad Metblogs » WeCite :: May 2006 Issue Launched! WeCite :: May 2006 Issue Launched! It’s bold… It’s naughty… It’s trendy… It’s the ‘IN’ thing… AND IT’s FINALLY OUT!!! The much awaited second issue of the ‘Randomly Specific’ E-Zine is out and it promises more insight, more gasps, and many eye-brow raising statements! Check it out today at The WeCite Magazine ! Copyright |2 thousand and 6| All Rights & Lefts Reserved. Btw.. Blogger is officialy UNBANNED in Pakistan. Happy bloging. Check metblogs Karachi for details. Thanks Asma and Detox for your kind words :) And thats great news that blogger.com is back in action for Pakistan. Many would be heaving a sigh of relief!